design, build and ship one to you! We offer many standard models of exceptional quality to suit each individual customers' needs. Kerr Trailers now offers custom built air brake trailers for the heavy truck industry. Please contact us to get a quotation for your project. Kerr Trailers goes the extra mile to satisfy our customers’ needs by manufacturing custom trailers. We have several categories; perhaps one will suit your needs. Kerr sliding axle trailers, with minimal loading angle, allows specialized machinery to be moved swiftly and securely. These trailers come standard equipped with an independent hydraulic system. 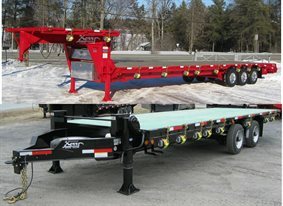 This line of Kerr flatbed trailers has earned a great reputation for its quality and durability. 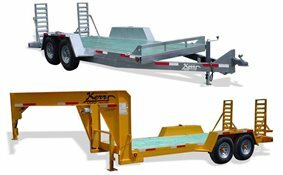 Kerr equipment trailers are designed to withstand intense use and their low center of gravity provides increased stability. Thanks to durable frames and simplicity, Kerr tilt trailers have proven to be an excellent product. Extra heavy lock-downs are used with cushion cylinders. Kerr custom dump trailers are sturdy, versatile and extremely reliable; ideal for multiple types of cargo. Kerr Trailers specializes in trailer manufacturing . 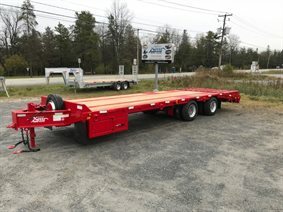 Located in Cookshire, Quebec, near Sherbrooke, Kerr Trailers is dedicated to the manufacture of steel flatbed trailers for light and medium-sized trucks. Since 1992 Kerr Trailers has built its name around the superior quality of its products and the excellent service it provides to its customers. Kerr Trailers is one of Canada's top trailer manufacturers. Kerr trailers has built high quality trailers that are used in the following business sectors: construction, forestry, landscaping, excavation, asphalt and agriculture. Whether you need to transport machinery, cars, equipment or raw materials, there is a Kerr Trailer that will suit your needs. With over 300 trailer model variations to choose from, we offer a huge choice of trailer models, whether you are searching for an open trailer, a landscape trailer, a sliding axle trailer or a dump trailer, you will find what you need at Kerr Trailers. We also offer custom design trailers, whether to add custom options or to create a unique trailer. At Kerr Trailers we use 3D computer-assisted design software which allows you to visualize your custom trailer prior to manufacturing. In 2018, we have delivered the first 6 trailers out of an order of 10 to Rheinmetall Canada Inc. 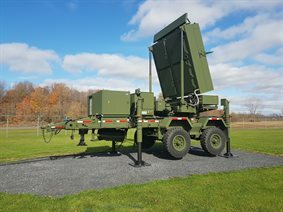 They will be used to transport the new medium-range radars for the Canadian Army. These radars are capable of detecting the source of indirect fire launched in rudimentary ways.